All right, Bay Area sweet freaks: DO IT FOR THE KIDS. Cookies, bars, brownies, cakes, confections of all sorts! Gluten-free or vegan? We even have you adorable crazies covered, I promise! So throw a little money at a good cause, and satisfy those sugar cravings for the entire week. Irvin, Annelies, Anita, Lisa and I have been working on making this year's San Francisco Food Blogger Bake Sale even bigger and better than last year, and we'd love for you to stop by and help support Share Our Strength. And, of course, fulfill all your carbohydrate needs. 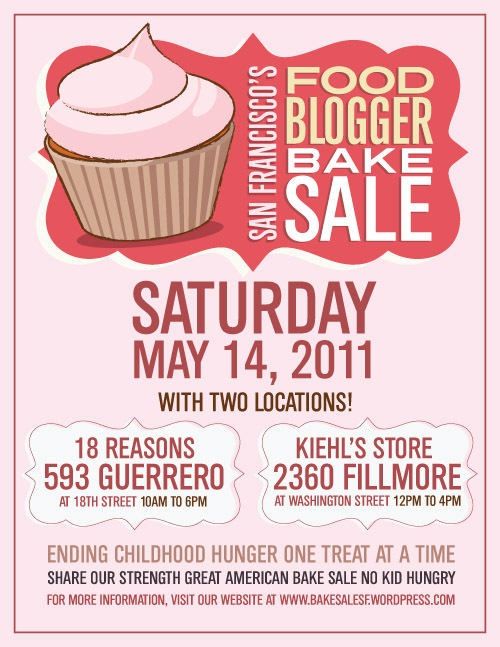 Our main post will be at the fantastic 18 Reasons in the Mission, but this year, in the spirit of going all next-level on this bake sale, we'll have a second location up and running in Pacific Heights at the Kiehl's store on Fillmore! So fuel up on desserts and get yourself a nice eye cream. Sounds like the perfect Saturday to me, people. Find out all the delicious details on our website. Hope to see you there!